Added the Significant Hail Parameter to the NAM-12km model. SHIP is similar to the STP & SCP. Values above 1.0 are correlated with large hail events. Here is more info on this product. A strong tornado passed very close to the Columbus, MS 88D tonight. Winds were measured by the 88D up to 163 mph around 250 feet. Several other scans measured winds into the 140′s. A debris ball and correlation co-efficient dropout indicated debris. 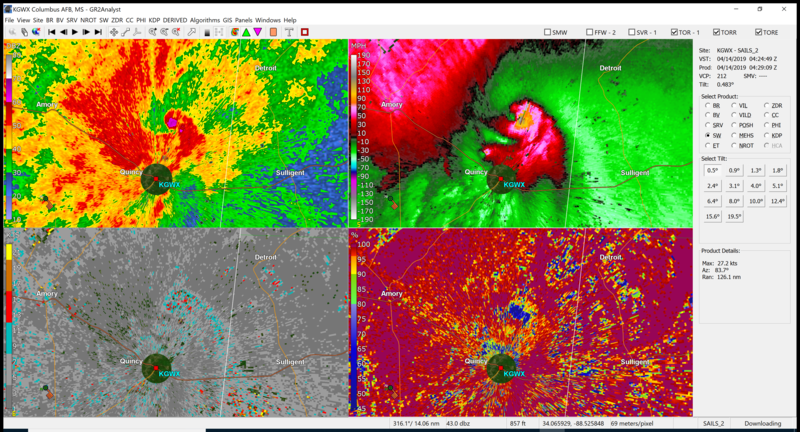 It’s pretty unusual to have a strong tornado so close to an 88D. But it has happened a few times in the past 30 years. Also of note is a smaller satellite vorticie/tornado just northwest of the RDA. It had winds to 90 mph. NCEP Implemented a data transfer encryption protocol change today. This impacted our ability to process some model data in ways we did not anticipate. We are working through the changes and expect to have the issues resolved shortly. This Saturday - 12/22/2018 around 10AM EST our Data Center provider will be relocating our equipment into a new facility with faster and more diverse internet carriers. This new facility also has more power and satellite receiving capabilities. This relocation will allow us to continue to expand the growing number of servers needed to process the rapid increase in meteorological data. Around 10 AM Wright Weather will be unavailable during this transition to the new facility (about 2 miles). We expect to have all services restored within a few hours. Expect a disruption in the 12/22/18 12Z Model cycle output and possibly the 12/22/18 18Z Model cycles. We expect to be fully operational by the 00Z model cycle. We appreciate your patience as we continue to grow. During the month of July NCEP upgraded the following models. We upgraded our systems to handle the newest versions of these models. The NCEP upgrade notes are linked below. We will be upgrading our system from GOES 13 to GOES 16 over the next couple of days. There may be some interruptions in a few of the satellite products as we make this major upgrade. The new GOES 16 satellite image will offer 60x the amount of data that the previous GOES 13 satellite provided. 4km infrared Imagery increased to 2km. 15 minute Full Disk scans at 6km. WSR-88D Digital Storm Total Precipitation has been added to all single site radars. This product differs from the traditional Storm Total Precipiation product. Uses Dual Pole data to improve ZR relationship to better estimate precipitation amounts. Here is a link to the Houston, Texas Digital Storm Total Precipitation. The new HMON Hurricane model which replaced the GFDL model model has been added. For details on the HMON model, which has a 2km inner core, see this NWS/NCEP document. When a tropical cyclone is active from the HMON it will be available under the “Tropical Products” menu. All storms from the Atlantic and Eastern Pacific are generated. The GFS Model is scheduled to be upgraded at 12Z Wednesday July 19th. There will likely be some delay as we convert over from the parallel testing code to the production code with the 12Z run. We will post an update once the new model is updating.